This video gives a good summing-up of what WYD08 was about. We arrived in Sydney, after a journey which began at 4.30 a.m. and ended at 10.00 p.m. Yesterday was a free day, which allowed the groups to wander around the city and get an idea of where things are. 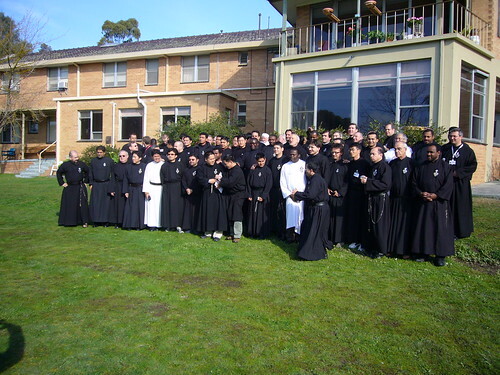 The priests had to go for their Photo-ID cards to an understaffed and undersized office. I managed to go through the process in just two and a half hours; some other Passionists were there for two hours in the morning and came back in the evening and waited for another four hours. Of course, no one complained! The weather here in Sydney is much warmer during the day, so people might lose the colds so many got in Melbourne. The relics of our young Passionist Saints (Saint Gabriel, Saint Gemma Galgani and Saint Maria Goretti) are now in the Passionist Church of Saint Brigid, Marrickville. -Photos and comment to follow when the pace slows down. Here is a link to the Blog of the Passionist Pilgrims from the United States. It’s 3.45 a.m. and I’m about to get on the bus to Sydney. We finished the Passionist Youth Encounter at Endeavour Hills, Melbourne last night. I hope to post about it tomorrow from Sydney. Meanwhile, some groups and individuals have been blogging from the PYE and as I receive their information, I will pass it on. There is one of these which I have already found: the Mount Argus World Youth Day blog. Enjoy it. 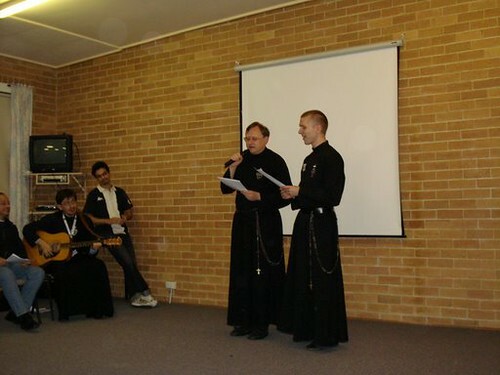 Each evening at the Young Passionists Meeting, after the Eucharistic Adoration, there has been recreation together, with different regions taking turns to lead the entertainment. On Tuesday evening, one of the regions involved was Northern Europe. Here is a photograph, courtesy of Brother Gabriel, of the Bavarian/Austrian Karaoke session. On the final day of the Young Passionists Meeting (Wednesday, 9 July), the morning was spent in dialogue between the young Passionists and the General and his Council. Father Ottaviano was keen that this session should be what he called a microfono aperto (open microphone) session, so that people would feel free to ask anything they wished. It was my job to chair the session and see that everyone who wished to do so had the opportunity to speak. It was very interesting to hear the concerns of the young religious from around the world, and I think it was a great thing for them to have an opportunity to raise any concerns or hopes that they have for our Congregation. After the dialogue, we concluded the meeting with a reflection from a representative of each conference on the questions What do I want to bring from this meeting? and What do I want the [Passionist] Congregation to bring from this meeting? This was followed by Father General’s concluding remarks. The morning ended with information about the next two stages of our pilgrimage: the Passionist Youth Encounter at Endeavour Hills, Melbourne, and the World Youth Day, where we will be based at Marrickville, Sydney. Before lunch there was an attempt at a group photograph, followed by lots of other photographs, in the monastery garden. Yesterday (Tuesday) was Day Four of our Meeting and the speaker was Father Ottaviano D’Egidio, the Superior General of the Passionists. Father Ottaviano spoke on Charism and Mission, another theme from the General Chapter. The main thrust of his talk was the importance of the relationship between our prayer and community life and our mission (the necessity of contemplative life in community for an effective ministry as Passionists), and what he described as Our Journey of Restructuring. Paul of the Cross, wishing the Passionists to be teachers of meditation to every person, held it necessary for them to become experts in prayer. 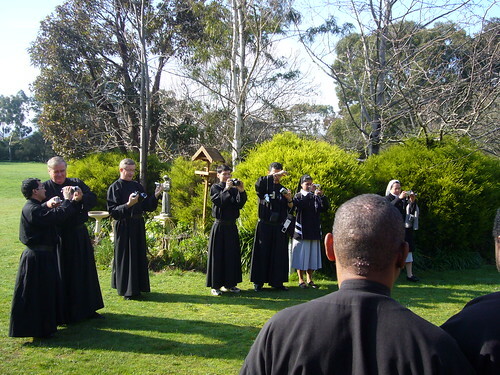 Consequently, life in the monastery is marked by an external silence which promotes interior silence for the religious and make them more attentive to the presence of God. In community the Liturgy of the Hours is prayed, the Eucharist is celebrated and every religious is required to spend at least one hour in personal meditation. I proclaim what I have contemplated and lived in intimate union with God in prayer, especially in meditation on the Passion of Christ. Monday was Day Three of the Young Passionists Meeting. Our theme for the day was Community Life, based on the General Chapter’s reflection The Passionist Charism is lived in Relationships. The speaker for the morning lecture was Father Amilton Manoel da Silva who is novice master for the Passionists in Brazil. Father Amilton gave his talk in Portugese. He talked about the meaning of charism in relation to religious life, how our specific charism affects the way we live our community life, and what he called the Mystical Aspect of the Passionist Community. He concluded by referring to the restructuring process in which our Congregation is at present engaged, and proposed a Model to Restructure without Losing the Tradition. Yesterday at the Young Passionists Meeting, the theme was The Passionist Charism – The Centrality of the Experience of Saint Paul of the Cross. Each day there is a lecture or presentation in the morning, following by a time of silence for prayer and reflection on the theme of the day. After this there is about an hour for group discussion of the theme. In the afternoon, there is time for the groups to report back and then a question session with the presenter. Yesterday’s presentation was given by me. Father Peter has put an edited version of it on YouTube, which you can look at below. I found the questions in the afternoon very good; I was encouraged by the insight of those who were asking very pertinent questions on our Founder’s charism and its relevance to young people today. The questions highlighted the importance of our key Passionist values of prayer, penance and solitude and the need to express these clearly in our way of living. The discussion groups are mixed language groups, although Father Enzo, who set up the groups, has tried to make sure that there are only two languages being used in any group and that there is someone in each group who can help with translation. Most people seem to be able to understand English, even if some cannot speak it very well, confirming that English is the new Latin. You will see on the video that I keep looking behind me while I am speaking. This is not because there was an angel prompting me, as was said to have happened to Saint Paul of the Cross, but because I was using Powerpoint as a prompt for me and a visual aid for my listeners. The paper I had prepared was too long to give in full, so I just led people through the Powerpoint highlights of what I wanted to say and gave them the written text to read afterwards. Some of those who are using English as their language during the meeting but who don’t speak English often (e.g. our Korean and Japanese brethren) told me afterwards that it was very helpful to be able to read as well as listen. It also was probably useful for those not accustomed to Glasgow accents.